Understanding the different types of smoke detectors available on the market, choosing and installing one in your home will keep your family and possessions safer. Smoke detectors save lives, and this small investment, sometimes less than $10, may end up being one of the best decisions you ever make. Smoke detectors can be powered either by the electrical current in your home or by battery power. There are advantages and disadvantages to both methods. Detectors that run off of electrical current do a great job when there's power - you don't have to worry about replacing the battery, and multiple units can be wired to work in concert, with all of them going off if one of them detects smoke, but they don't work at all in a power failure. Battery powered units work independent of one another and still create a loud alarm, but you have to replace the batteries regularly. There is a way to get the best of both worlds by installing electric smoke detectors with battery backups. That way you have a fallback if the power goes out for a while. Another option is to place inexpensive battery operated units near wired units as backups. That way you won't need to change out your expensive electrical setup to get some added peace of mind. 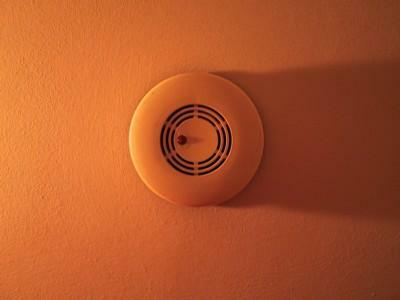 There are two basic operating methods for smoke detectors and each uses a slightly different scientific principle to cause an alarm to sound when the technology detects the presence of smoke. Photoelectric Smoke Detectors - This style of smoke detector uses lights or lasers to monitor a volume of air and sets off an alarm if smoke particulates block the amount of light hitting the sensor. Ionization Smoke Detectors - This technology is a little different. It uses electrically charged ions instead of light to detect the presence of small amounts of smoke in an ionization chamber of the detector itself. Both smoke detector technologies are considered safe and effective, although they may be marginally more effective at detecting one type of fire over another, with photoelectric models doing a better job of detecting smoky fires and ionization detectors having a slight advantage in detecting early flame fires. Some experts will tell you that either works well while other specialists will recommend that you have at least one of each. Regardless of the types of smoke detectors you choose, the important thing is to have one or more on hand and to make sure that they're working properly. Most units will have a method for testing the alarm and making sure that the battery and mechanism is powered and operating. Read and retain the instructions that came with your smoke detector and instruct your family on how to test your detector and change the battery. Never disable your smoke detector as a means of dealing with a false alarm. You should take the time to test your smoke detectors monthly, and replace the batteries at least once a year. Using rechargeable batteries will be less expensive over time. While you're at it, invest in a fire extinguisher for your kitchen, and devise an escape route for your family in case you do have a fire in your home.